In contrast to the truly uninspired Pepsi Facebook strategy we reviewed last week, a small nonprofit here in the Bay Area, is doing something very interesting and increasing fan engagement at the same time. Probably not a coincidence! In the spirit of transparency, this nonprofit is a ThinkResults client but we did not come up with this strategy. They devised it all on their own and it’s brilliant. Thursday: Thursday’s Tail is a short bio or story about one of our dogs, supporters, students, etc. 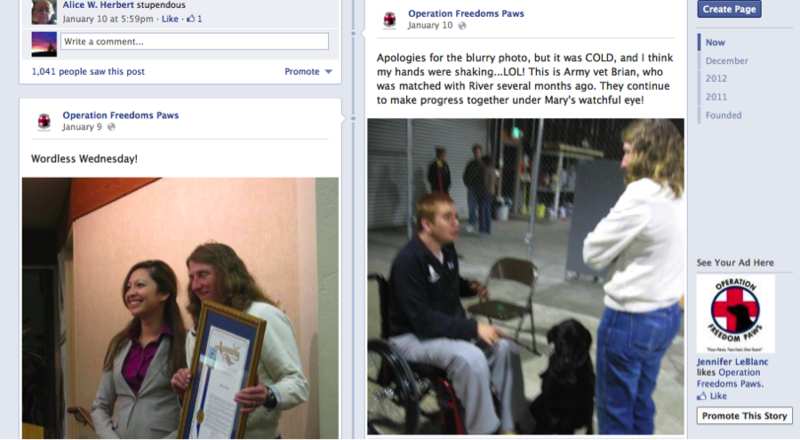 Following the explosion of fans after Mary was selected as 2012 Top 10 CNN Hero, the Operation Freedom Paws team needed a way to structure their Facebook posts and continue the conversation with their fans. This strategy allows them to share Mary’s extensive expertise in dog training, show off some fun photos, and share the stories of the people and organizations that are part of their ecosystem to support the vets and the dogs. And as an administrator on the page, I can tell you that Mondays are very busy with training tip requests! People are loving being able to write their requests in and see the answers. So why does this work? Because OFP is delivering quality, engaging content on topics that matter to their fans. This is the heart of any good content marketing strategy. And you don’t have to be big to be smart.